Today, when you order "The Magpie - Jack Rhodes & Joel Dickinson", you'll instantly be emailed a Penguin Magic gift certificate. You can spend it on anything you like at Penguin, just like cash. Just complete your order as normal, and within seconds you'll get an email with your gift certificate. 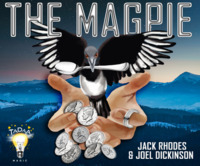 The Magpie - Jack Rhodes & Joel Dickinson (Instant Download) This is freak out magic and it is up close. Astonishing and practical. Imagine coins materializing from thin air. Then a handful of coins transform into a finger ring. The ring then jumps from the pocket back to the hand and then the ring visually morphs in to a spoon. 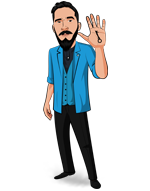 - Kieron Johnson, Magic performer & creator. Includes HD explanation covering all the details from the sleights to the subtleties. Well, this is already one of my favorite visual sleight of hand routines. Routining: IMO, this is a mini masterclass on how to routine a quick, visual sleight of hand effect. The magician is always ahead, the misdirection is built in, and there are plenty of genuinely astonishing moments. From the time the routine begins, the magician sets and then confounds expectations with magical twists of eye candy. It's a routine that can be equally effective done silently or with scripting, IMO. Teaching: You should have no question how to practice and perform this after viewing the 29 minute video. Following the live performance on the trailer, Jack Rhodes walks through a studio demo of the routine, followed by a silent version on the street. He then provides a succinct overview of key methods and moments, including every sleight he uses in the routine. This is the shorthand version of the explanation, which will be sufficient on its own for guys who are experienced or have already watched the entire video. Following that section is an in-depth look at every sleight, usually shown from more than one angle. The explanation strikes the right balance between clarity and efficiency - you will be neither confused nor bored by it. Practicality: All you need to perform this is a coin, a ring and a spoon. If you only have one or two of those, you can eliminate the sections that require the other props, and still have a killer, shorter routine. There are the usual angle issues - ie, if there's someone peering over your shoulder, you'll need to either kick them in the shin or keep your arms closer to your body during certain portions of the routine. Actually, for the third phase there is also one wardrobe accessory used, but it can be swapped out with other items of zero to nominal cost that accomplish the same thing. Results when performing: I've performed this three times now, just to give it a quick spin before reviewing it, and got positive reactions on all three occasions. One was the wife test, and the other two were for strangers. Best part was the genuine "WTF?" reactions from all three when the coins change into a ring, and again when the ring changes into a spoon. The routine is not difficult to perform, but it requires practice and talent to make it look as good as Mr. Jack Rhodes does. I'm not there yet, but fortunately you don't have to be. This is one of those routines that will reward perfection without requiring it. The slights and hand positioning that is taught here is worth 10x the price! Very good. Handling good for the beginner. Clear explanation. This is beautiful magic with an awesome kicker ending. I love it. Plus, there’s no gimmicks needed and the sleight of hand required isn’t hard. For less than 10 bucks you really can’t go wrong. Can't wait to work on the kicker ending too. This has so many applications to the existing coin magic I already do. My heads spinning with the possibilities this gives. I'm thinking a long the lines of Jay Sankey's Stirring Silver... or even Spoon to Fork. The best I've seen so far. Instructions are clear and easy to understand. Magpie is incredible. Easy to do, brilliantly taught and a bargain. Be crazy not to!